Carl enjoys the Lake Tahoe lifestyle. An avid snow skier, Carl has had passes at Kirkwood and/or Heavenly ski areas for over 25 years. In the winter, it’s common to see him on the ski slopes taking 5 or 6 runs in lieu of lunch. Or, perhaps you will see him “cellular skiing” – start at the top of the mountain and ski “as the crow flies” to a country road (or some faraway neighborhood), then use your cell phone to call a taxi for a ride back to the base lodge. The summer months find Carl on the links at beautiful Edgewood Tahoe Golf Course, mountain biking along the fabulous flume trail overlooking Lake Tahoe, or enjoying the gorgeous blue waters of the lake on his boat. While his 2 sons were growing up, he could be found coaching baseball (from T-ball to Assistant Coach in high school). Carl has a serious side, too. He became to Broker-Owner of CENTURY 21 At Tahoe Paradise (at that time known as CENTURY 21 Yank’s Realty) in 1990. After joining the company in 1981, Carl was top sales agent for several years, and he was promoted to Sales Manager in 1985 before becoming the owner. 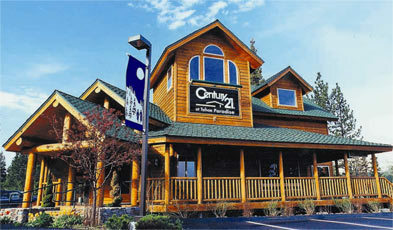 In December 2002, Carl opened a second CENTURY 21 At Tahoe Paradise real estate office near the Heavenly Gondola. The new office is located in the Crescent V shopping center at the hub of Lake Tahoe’s South Shore, which is next to the Nevada state line. Both CENTURY 21 At Tahoe Paradise offices now offer a staff of over 40 top realtors and their assistants, a Director of Sales and Marketing, and a Vacation and Permanent Rentals Department. Carl is most proud of a project he completed in the late 90’s. At that time, he put his architectural talents to work and developed an acre of land on Highway 50 at the base of Echo Summit and the gateway to Lake Tahoe’s South Shore. Named Meyers Station, this alpine village houses several buildings, including the CENTURY 21 At Tahoe Paradise main office. Meyers Station was the recipient of the South Lake Tahoe Chamber of Commerce Best New Commercial Construction award for 1996. In addition, Meyers Station also won the Tahoe Regional Planning Agency award for Best New Community Plan Construction in 1997. As a member of all regional boards of REALTORS®, Carl’s office can provide you with access to all properties currently for sale in the area. Let Carl know what you are looking for in Lake Tahoe real estate.